The Yellow River (Huanghe 黄河), before the Han period just called "River" (He 河), can be seen as the cradle of Chinese Culture. The oldest Chinese cultures, the most famous of which are the Longshan 龍山 and Yangshao 仰韶 cultures, were located in the Yellow River plain. The colour of the river is yellowish, due to the huge amount of silk washed out of the loess deposits in northeast China. Yellow therefore represented the "natural" colour of the early Chinese communities and the early dynasties, and in correlative thinking became the colour of the centre. In Chinese mythology, the Yellow River was controlled by a river deity, the Earl of the Yellow River (Hebo 河伯). It was also the source of the so-called River Chart (hetu 河圖), a symbolic diagram inscribed on the back of a turtle. Click to enlarge (new tablet). The Yellow River emerges in the Tibetan Plateau and then runs to the northeast through a mountainous region in the provinces of Qinghai and Gansu. In the eastern parts of that province, it starts to form a gigantic bend, whose northern parts touch the southern fringes of the Gobi Desert. On its way back to the south, the river and its tributaries obtain the greatest part of loess silt. The loess plateau was largely deforested since the late Warring States period 戰國 (5th cent.-221 BCE), and since that time has lost huge amounts of soil to erosion. The northern region of the inner part of the great Yellow River bend (with an extension of c. 300 to 500 km) is called the Ordos Plateau. It forms the northern part of the province of Shaanxi. At its southern end, a sudden change in the direction of flow is seen. This is the place where the River Wei 渭水 sheds its water into the Yellow River. The course of River Wei was the political centre of the Western Zhou 西周 (11th cent.-770 BCE), the Qin 秦 (221-206 BCE), the Former Han 前漢 (206 BCE-8 CE) and the Tang 唐 (618-907) dynasties, with the capitals Hao 鎬, Xianyang 咸陽 and Chang'an 長安 (today's Xi'an 西安). Shortly eastwards, the Yellow River passes the Dizhu Cliff 砥柱, today located at the Sanmen Gorge 三門峽 with its large dam. The course of the Yellow River was quite stable until the place where another tributary, the River Luo 洛水, brought its waters. At its banks, the Eastern Capital Luoyang 洛陽 was located, political centre of the Eastern Zhou 東周 (770-221 BCE) and Later Han 後漢 (25-220 CE) dynasties. From this point on, the lower course of the Yellow River fluctuated immensenly over the last thousands of years. The location of its estuary ranged from today's Tianjin to south of the Shandong Peninsula. Other important tributaries are River Fen 汾河 and River Qin 沁河, both originating in the province of Shanxi. The Yellow River is 5,464 km long and carries an annual amount of 57.4 billion m3 to the sea, including 1.6 billion tons tons of silt. The drainage area is 752.000 km2 large, and it nourishes an agricultural area of 180 million mu 畝 (see weights and measures), feeding 89.59 million people. The silt carried with the waters of the Yellow River was not only the cause for the fertility of the Yellow River plain, but also caused immense floodings because it made the bed of the Yellow River in many places higher than that of the surrounding territory (a situation called in Chinese dishang xuan He 地上懸河). When the waters of the Yellow River broks dams they inundated large tracts of land, devastated the landscape and destroyed the fields and irrigation canals. In the course of time, the Yellow River several times changed its course. These changes are the focus of this chapter. Historians have analysed the changes in the course of the Yellow River and came to the conclusion that in the last 2,500 years there were 1,593 minor changes, 26 larger changes, and six times the river chose a very different bed in its lower course (see Map 2), in a great distance form the former one. Each greater change was not only accompanied by the death of thousands of drowned people, but also necessitated new arrangements in the waterways, particularly the tribute grain transport along the Grand Canal. Apart from the huge amount of silt carried with the water, the climatic situation is one reason for the many floods caused by the Yellow River. In its upper and middle courses it runs through dry areas, where 70 per cent of the precipitations fall in summer and autumn, resulting in high water levels during that time. A third reason is the low topographical gradient of the lower course of the river, which facilitates the sedimentation of silt. As a fourth reason, the deforestation of its middle course must be taken in consideration. Since the Han period at latest, the lack of a natural vegetation cover caused heavy erosion in the middle course of the river. In pre-imperial times the lower course of the Yellow River was split up into several branches, the so-called "Nine Rivers" (Jiuhe 九河). Their bed was relatively stable. The construction of dams (tifang 堤防) to prevent inundations began during the Warring States period. The major mouth of the river was located at today's Huanghua 黄驊, Hebei, south of Tianjin. Its course is described in the book Shanhaijing 山海經, the chapter Yugong 禹貢 of the Confucian Classic Shangshu 尚書, and the treatise on geography Dilizhi 地理志 in the official dynastic history Hanshu 漢書. According to Han period sources, there was a first change in 602 BCE, but a specification about the course of the river cannot be established. Between 132 BCE and 109 BCE the first great change took place that can be described in detail. After a break of the dams at Huzi 瓠子 the Yellow River flew south into the bed of the River Si 泗水, a tributary of River Huai 淮河, before returning to the north. After 11 CE it run again southwards between the Rivers Ji 濟水 and Bian 汴水. 60 years later this way silted up, and it changed back to its northern course. This time the riverbed was secured against further changes by a huge hydraulic project of dyke buildings carried out under the supervision of Wang Jing 王景 (fl. 69 CE). The dyke system was quite sophisticated and equipped with sluices that helped to take the pressure from the dams in times of high water level. The dam project covered the area between Xingyang 滎陽 to Qiancheng 千乘. 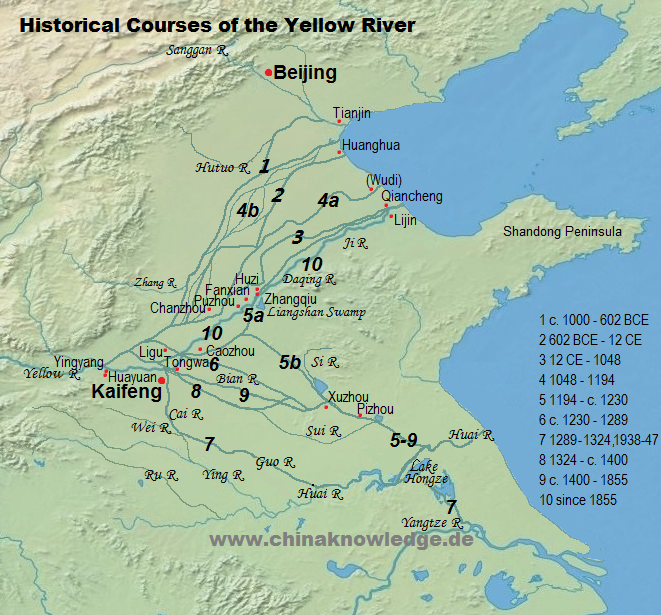 The Han period branches of the Yellow River had different names. They were known as Lingmingdu Channel 靈鳴犢河, Tunshi Channel 屯氏別河, Zhangjia Channel 張甲河, River Lei 漯水, Bian Canal 汴渠 and River Ji 濟水. Over the following 700 years the course of the Yellow River remained in that line. The relative stability of the river course was one factor for the successful implementation of the canal systems during the Sui 隋 (581-618) and Tang periods, mainly the Yongji Canal 永濟渠 and the Tongji Canal 通濟渠. Only in the 10th century huge transformations in the river landscape took place again. These were also the result of deliberate openings of the dam by warlords, with the intention to flood areas where inimical troops marched through. But it was mainly natural disasters which contributed to several large-scale changes in the course of the Yellow River. Historians count more than 210 minor and major changes during the Song period 宋 (960-1279). In the early decades of the Song period the Yellow River plain seems to have been a kind of marshland, due to the many floodings. Particularly endanged was the region of Chanzhou 澶州 (today's Puyang 濮陽, Henan), from where the river built a new course as the Henglong River 横隴河, shedding its waters into the sea at today's Wudi 無棣, Hebei, from 1048 on (after a break at Shanghu 商胡, close to modern Puyang) even more northwards in Nigu 泥沽 (near today's Tianjian). This was the Northern Branch (Beiliu, with the smaller branches Shanghu 胡商北流, Xiaowu 小吳北流, and Neihuang 內黃北流), while from 1060 on a new Eastern Branch (dongliu 東流, also called two-branch river, erguliu 二股流) flow into the sea at Wudi. For more than ten years, a fierce dispute was fought out at the court, which of these two courses would be the one to secure in the future. In the end, the northern branch became the stronger one. Politically seen, this was a disadvantage because the northern branch was located in the territory of the Liao empire 遼 (907-1125) of the Kitans, northern neighbours to the Song empire, while the southern branch silted up and lost its function as a defensible borderline. In 1069 therefore, a new hydraulic project was begun to force the main current of the Yellow River back to the southern branch. The project was successful until 1081, when a new break of the dams again changed its course northwards. The successful project of redirecting its course was repeated, but had to be given up forever in 1099, when the northern course became the exclusive one, while the southern one dried up. 1 Western Zhou • 2 Eastern Zhou from 602 BCE until the end of the Former Han • 3 from 12 CE to the early Song, 1048 • 4ab Northern and eastern courses during the Northern Song • 5ab Jin/Southern Song from 1194 • 6 mid- and late 13th century • 7 Yuan period from 1289, and 1938-1947 • 8 from 1324 on to the early Ming • 9 Ming period until 1855 • 10 1855 - today. Click to enlarge (new tablet). A major change took place in 1168, when the dams broke at Ligu Ford 李固渡, and the waters of the Yellow River chose a throghouly new path to the south and created a southern branch (nanliu 南流) along the former southern course, beginning in Xuzhou 徐州, and entering the bed of River Si in Pizhou 邳州. The northern branch (beiliu 北流), somewhat weaker than the southern one, continued to flow in the former bed. From 1208 on the two branches unifed again in the southern bed, so that the estuary of the Yellow River was south of the Shandong Peninsula. When the Mongols assailed the Jin empire 金 (1115-1234) in northern China, they two times opened the dams of the Yellow River to drown the enemy's troops and to force besieged cities to surrender: Once in 1232, and once in 1235. The result was that the River sought a new bed, this time much more to the west, in the beds of the rivers Guo 渦水 and Ying 穎水, tributaries of River Huai. It came back to the east, in the bed of River Si, in 1279. In 1344 the dams broke again, and the floods used the artificial Huitong Canal 會通河 towards the northwest. In 1351 a hydraulic project guided by Jia Lu 賈魯 (1297-1353) dredged the former course, widened it and had sluices built into the dams. From that time on the Yellow River obtained a more regular course through the bed of the rivers Si and Huai, in the so-called Jia Lu Canal 賈魯河. This course remained more or less stable until the 19th century. In the early decades of the Ming period 明 (1368-1644), there were still a substantial branch running north of the Shandong Peninsula, but from the mid-15th century the southern branch was the dominant one, apart from a flooding in 1448, when River Qinghe became the main bed for seven years. In 1489 the dams broke at Kaifeng 開封, Henan, and the waters inundated the beds of the rivers Bian, Si, Guo and Ying, before turning back to that of River Huai. A southern arm continued in the beds of the rivers Ying and Guo. The danger that the Grand Canal would be destroyed again remained. Because the Ming dynasty shifted their seat of government to Beijing, they were very much interested in the functioning of the Grand Canal, by which the capital would be supplied. In several large-scale projects, the first one carried out by Liu Daxia 劉大夏 (1436-1516), dams and dykes were built to stabilize the River. A double system of dykes over 300 kilometers would secure the surrounding land against larger floodings. Further construction projects (hegong 河工) were carried out during the Jiajing reign-period 嘉靖 (1522-1566), but they could not prevent dam breaks that occurred from time to time. Just in the most unfavourable time, during the suppression of the Taiping rebellion 太平, in 1855, the dams of the Yellow River broke at Tongwaxiang 銅瓦廂 in the district of Lanyang 蘭陽 (or Lanyi 蘭儀, today's Lankao 蘭考, Henan). The government of the Qing dynasty 清 (1644-1911), in greatest distress, did not have sufficient reserve to fight against the inundation. The River changed its course again and split up into three branches, the largest of which chose the bed of the Daqing River 大清河 north of the Shandong Peninsula, running through Puzhou 濮州 and Fanxian 范縣, submerging the Grand Canal at Zhangqiu 張秋鎮, and a new mouth in Lijin 利津, Shandong (close to the present course). In 1875, this course was secured by large dams. Another branch close to it run parallel. A southern course branched off in the prefecture of Caozhou 曹州 and run southwards through the bed of the rivers Si and Huai. The change of the Yellow River back to the north critically effected the Grand Canal. Its southern parts had silted up to such an extent that for several years the tribute grain was brought to the north by the sea route. Between the 1855 break and 1884 there was nearly no year without floods in the province of Shandong. This situation contributed to the rise of rebellious groups in that province, first the Nian 捻, and later the precursors of the Boxers. Sengge Rinchen 僧格林沁 (1811-1865) and Li Hongzhang 李鴻章 (1823-1901), fighting against the Nian rebels, even deliberately inundated territory controlled by them by opening the dams of the Yellow River. In 1938, the famous man-made inundation was caused by the National Revolutionary Army (guomin geming jung 國民革命軍), in order to prevent the invading Japanese army from advancing. They stitched the dam at Huayuankou 花園口 and caused the death of 890,000 innocent peasants. The waters of the Yellow River flew southwards again, along the Jia Lu Canal, the rivers Ying and Guo, the bed of the Huai River, but then southwards, and flew into the Yangtze River at Yangzhou. This situation remained until 1947, when the river was again forced into the old bed at Huayuankou. The results of the many flood disasters following the break of a dam were horrible. People who did not drown (in 1895, for instance, more than 250,000 dead), suffered famine and wandered around, having lost their fields and homes. The inundations devasted the agricultural landscape and transformed fertile soil into barren land covered with sand. Salinization haunted the destroyed areas after the retreat of the floods and contributed to the loos of fertile land. In some cases the floods even transformed the landscape. In 944, for instance, the floodwaters created the famous Liangshan Swamp 梁山泊, known from the romance Shuihuzhuan 水滸傳. The area endangered by regular deluge in the provinces of Henan, Hebei, Shandong, Anhui and Jiangsu amounted to no less than 250.000 km2. Shen Bing 申丙 (1960). Huanghe tongkao 黃河通考 (Taibei: Zhonghua congshu bianshen weiyuanhui). Tan Qixiang 譚其驤, ed. (1986). Huanghe shi luncong 黃河史論叢 (Shanghai: Fudan daxue chubanshe). Yang Xiuwei 楊秀偉 (1986). "Huanghe gaidao 黃河改道", in Zhongguo nongye baike quanshu zong bianji weiyuanhui 《中國農業百科全書》總編輯委員, ed. Zhongguo nongye baike quanshu 中國農業百科全書, Shuili 水利卷 (Beijing: Nongye chubanshe), Vol. 1, 307. Edmonds, Richard Louis (1994). Patterns of China's Lost Harmony: A Survey of the Country's Environmental Degradation and Protection (London/New York: Routledge). Elvin, Mark (2004). The Retreat of the Elephants: An Environmental History of China (New Haven/London: Yale University Press). Marks, Robert B. (2012). China: Its Environment and History (Lanham etc. : Rowman and Littlefield). Pietz, David Allen (2002). Engineering the State: The Huai River and Reconstruction in Nationalist China, 1927-1937 (London/New York: Routledge). Viollet, Pierre-Louis (2007). Water Engineering in Ancient Civilizations: 5,000 Years of History (IAHR International Association of Hydraulic Engineering and Research).